Our Hoops and Yoyo winders are very similar in functionality but appeal to flyers differently. Both winders offer a simple hand-over-winder technique for rewinding and both offer a large amount of storage capacity. They are practical for flying a small fighter kite to a large parafoil. Both are offered blank or with a wide assortment of lines. Our Hoop winder is the only spool we import. We mold it in assorted colors of virgin ABS plastic and import it because there’s nothing of comparable qualtiy made in America. It is available in five sizes (diameters 5 to 9 inches) so you can match hand-size as well as line-size. 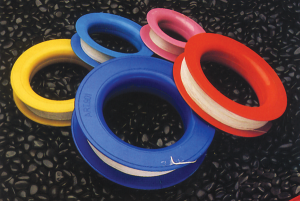 The sides of the Hoops are straight and parallel giving it greater storage capacity than Yoyo winders. We sell them blank or wound with any of our Shanti lines. Our Yoyo winders are made in the USA. These colorful winders are similar to Hoop winders but the Yoyo is slanted on one side to allow the winder to be laid flat on the ground to let the line “pay-off” the slanted side easily. This feature makes the Yoyo winder the preferred spool for fighter-kite pilots who want their hands free to handle the line. This is also useful when rewinding because it helps the line remain tangle-free. Yoyo winders are available in 6 or 9 inch diameters, blank or with any Shanti line, including cotton.